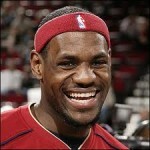 Is LeBron James The Greatest NBA Basketball Player Ever? LeBron James, the Miami Heat forward has reacted to Scottie Pippen’s comparison between him and Michael Jordan but simply commented that he does not believe he’s done enough to merit mention among the game’s greatest players. James seemed uncomfortable with the discussion dragging his name alongside with some basketball greats by saying “Michael’s an unbelievable player,” James said. “I’ve got a long way, long way, to be mentioned as far as one of the all-time greats. Not even just Jordan. There’s a lot of great players who have played in this league. Larry Bird, Kareem Abdul-Jabbar, all these guys who are floating around with multiple rings, Bill Russell, all these guys who have pioneered this game,” James said. “I’m gracious. Humbled by Scottie’s comments, especially with him being a teammate of his and seeing Michael on a day-to-day basis. But as far as me, I’m not going to sit here and say I’m better than Jordan. I’m not better than Jordan,” he added.